Use: Training and safety aid. In training, the cover is used in conjunction with the aircraft instrument portion of VFR private pilot rating instruction, IFR training, new aircraft type endorsements, bi-annual renewals, and other aviation proficiency issues. As a safety aid, the cover is used when an instrument actually becomes non-functional. FAA regulations and safety requirements dictate that the instrument be covered and labeled as non-functional. 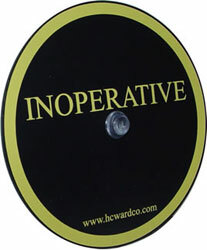 Description: A plastic disk 2-3/4" in diameter and approximately 1/16" thick. By use of the attached suction cup, the cover will mask the face of most general aviation flight instruments. 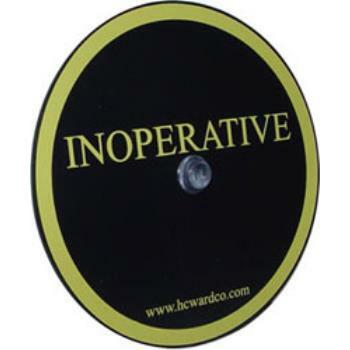 Mounting and Removal Instructions: To mount the cover, align the center of the suction cup, mounted in the center of the cover disk, with the center of the selected instrument face. Press the cover disk gently until the suction cup holding the cover disk is firmly in place. Release the pressure. The cover disk should now stay attached to instruments face. To remove the cover disk, grab the side of the cover disk and gently and peel it off the face of the instrument. Disclaimer: This product is to be used only as an aid. While every effort has been made to ensure that the Flight Instrument Cover will mask the instrument and will stay put under most common conditions, unique circumstances will occur. Therefore the user should be prepared to use an alternative cover, if the necessity arises. The use of this product does not relieve the pilot of any of the responsibilities necessary to fly safely, navigate correctly, and communicate clearly. There are no warranties expressed or implied concerning this product’s accuracy. H.C. Ward, Co., or any other entity involved, bears no liability for the consequences of the use of this product.